Kate Hooray Osmond uses gold leaf to create light in her paintings. For Kate Hooray Osmond, the artistic process begins at roughly 600 feet above the earth. That’s right, the landscape artist starts many of her pieces by leaning out of a helicopter. 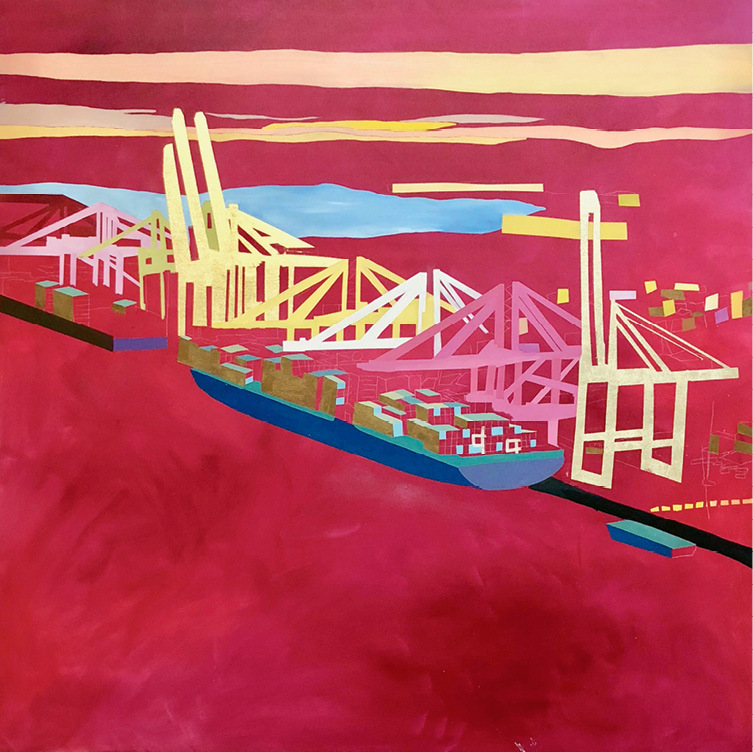 Her gold-leafed paintings—often primary colored contrasts of the Carolina coast and industrial sites—are sourced from images taken flying above the Lowcountry. But chopper acrobatics aren’t all this Miller Gallery artist is about. The South Arts State Fellow does installations too, including one with 6,000 dominoes on view at ArtFields beginning April 26. The process behind the painting: Anything aerial is from a photo I took from a helicopter. I’ll pick targets I think will be interesting, like a paper mill or steel plant. Then I’ll hire a helicopter and go around for an hour or two with the door off, tilting so that I can get a good angle. I love to get the big picture of everything because it’s more experiential—a photo from Google Earth wouldn’t be the same. All the gold leaf: The first time I used gold leaf, I just wanted to create light in a piece, but it has kind of taken over my art practice, which I don’t mind at all. To me it represents energy and vibration—the spark within any system that gets it going. I’ll use it for roads in a piece, or cables, things that make connections. Landing in Charleston: I’ve been all over, basically seen North America from a helicopter. There’s something about Charleston that’s almost like living in one of my paintings. You have industry next to this vibrant environment. At ArtFields: I have 6,000 clear dominoes I’ve covered in gold leaf and then oil paint. Thoughts and Prayers is essentially an ocean of dominoes. There will be no restriction on the viewer as to whether they want to set them up or topple them over. The inspiration is the interconnectedness of individuals within a group and how that’s a very stable force but also very fragile. Inspired by symphonies: I see light as a symphony. I like the math of it and how it correlates so much to how I see light as a spectrum, and how in a painting you can have all these pieces coming together. Maybe it works, maybe it doesn’t. What’s next? My next project is 59 paintings and the 6,000 dominoes for my MFA thesis. I also have a solo show at the Miller Gallery on November 1, and I’m working on more collaborations—one with local artist Laura Dargan and one with an Atlanta-based artist Mary Stuart Hall.